Islamabad: Following bilateral government consultations on development cooperation between the Islamic Republic of Pakistan and the Federal Republic of Germany that were held in September 2015, a new commitment of EUR 10m has been granted for Livelihood Support and Promotion of Small Community Infrastructure Programme (LACIP) Phase II. The programme will be executed in three years time and will contribute to greater political participation of villagers in decision making at the tehsil and village councils levels for infrastructure development and livelihood improvement. It has been designed to support the decentralization reforms in selected districts of Khyber Pakhtunkhwa. The LACIP Phase I which was financed with an amount of EUR 31.5 is expected to complete by December 2017. The Pakistan Poverty Alleviation Fund (PPAF) signed a contract with KfW, the German Development Bank for LACIP financed by KfW. KfW official Elke Metzen, Sr. Senior Project Manager, Governance & Peace Division, KfW Frankfurt, Germany visited Islamabad, and granted a new agreement of EUR 10m for LACIP Phase II. Metzen had detailed consultations with partner organizations of PPAF during her stay in Islamabad. PPAF will be involved in implementation of LACIP Phase II and has shared design, methodology and implementation strategy of the programme. Metzen also had meetings with representatives of local government in district Shangla and Buner to give them insight of the programme discussing the issues and possible solutions. This programme is expected to build public physical infrastructure schemes inclusive of disaster management and climate adaptation aspects that will be rehabilitated, enhanced and/or (re-) constructed. Similarly for enhancing livelihood development, skills training and related asset transfer would be implemented on a group-based approach. The beneficiaries of this programme will be mobilized and organized in a variety of groups and institutional development with focus on integrated village development in collaboration with local government. The LACIP Phase II will be operational in selected areas of three districts of KPK i.e Shangla, Buner and Lakki Marwat. The partner organizations in this phase will set up development plans adopting the participatory approach in consultation with beneficiaries of village/neighborhood councils on which specific measures will be identified and prioritized. 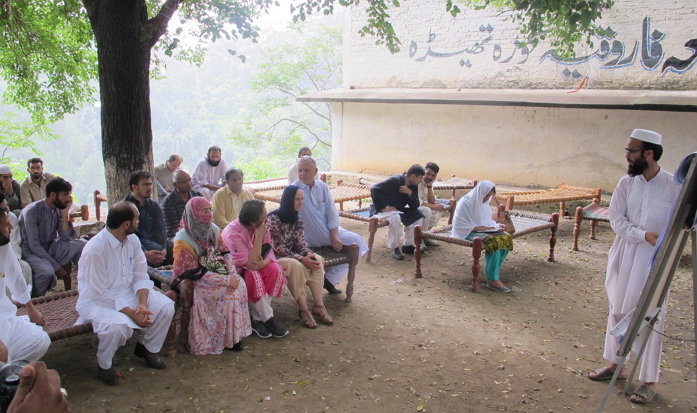 During the visit, Elke Metzen also visited communities in district Shangla and Buner to review the progress and impact of the KfW funded LACIP implemented by PPAF through National Rural Support Program and Sarhad Rural Support Programme. The KfW and PPAF officials held meetings with other government officials including Dr. Ubaidullah Khan, District Nazim Buner, Yousaf Ali Khan, Naib Nazim, District Buner, Niaz Ahmed Khan, District Nazim, Shangla and Tariq Mahmood, Assistant Commissioner, Shangla during this visit. The Pakistan Poverty Alleviation Fund (PPAF) signed a contract with KfW, the German Development Bank for LACIP financed by KfW. KfW official Elke Metzen, Governance & Peace Division, KfW Frankfurt, visited Islamabad, and granted a new agreement of EUR 10m for LACIP Phase II.